The Day of the Big Dance! Good evening all you Merri-Mac folks! 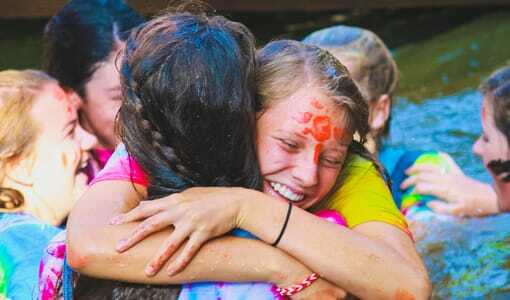 Your daughters had another incredible day here at camp, filled with joy, friendship, and accomplishment. The sun rose and lingered over camp today, which was certainly a welcome change from the past few days’ rain. 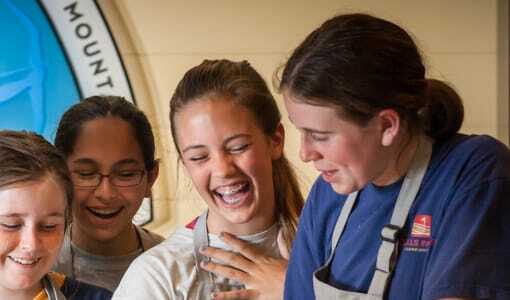 The renewed earth matched the revitalized attitudes of campers and staff alike, and a breakfast of biscuits, eggs, and hash browns nourished our bodies. In chapel, Rainbow counselor Elizabeth P. defined Jesus as our source of hope and strength, recounting a rainy night on her Black Mountain Expeditions trip that ended in singing and hopeful spirits. 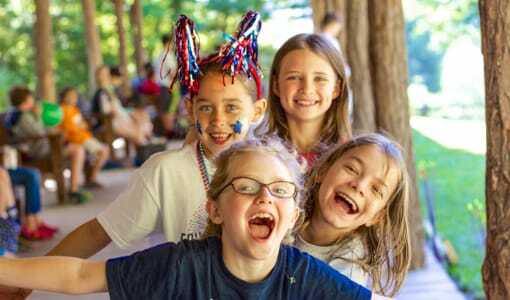 Soon after, the bugle rang signaling the beginning of activities, and girls scampered all over camp to learn new skills and to work on their bronze, silver, and gold bars, which mark their achievements. Amy J. tells me in high spirits, “In Kayaking, the teachers are so involved; there is a lot of one-on-one teaching, and we learn a lot in a short amount of time.” Sure enough, as I scan Lake Doris, even as early as 10:30, when the water is still a bit chilly, almost every camper is paired off with a counselor to learn their next skill. Girls in Diving today focused on the position of their hands while diving and perfected various dives for their bars. In Swimming, Mairin M., Ella M., and Anne Gardner L. earned their bronze bars! This time of camp is when many girls have learned basic skills in activities and are ready to get, at the very least, their bronze bars. Bars are an exciting accomplishment as they are read out and recognized at the White Feather ceremonies and account for marks towards White Feather promotions. Overlooking the lake in the Mike, Maddie M. began climbing the overhang wall to earn her silver bar: the overhang is a section of the rock wall that juts out at an angle and is very difficult to climb! Other girls practice their knots and prepare to climb other sections of the wall. Up from the lake, I heard the whack of tennis balls hitting rackets. Sure enough, Tennis were running drills and working on their forehands and backhands. 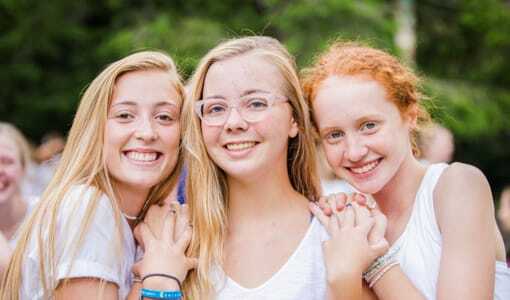 Ashlynn K. says that taking Tennis at camp is great because she gets to learn from different instructors than those at home and play with different girls. 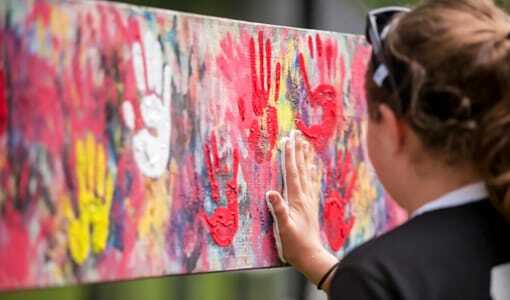 Camp is a great place to not only participate in activities most likely not offered at home, but also to see new perspectives of the activities they already enjoy doing. Everyone and their stomachs were eagerly awaiting lunch, and the kitchen delivered with a camp favorite: Tacos in a Bag. This is where we scoop beef, lettuce, tomato, sour cream–the works–into a bag of Fritos, shake it up, and then eat out of it! The meal finished with ice cream sandwiches and a very exciting announcement. The young men at Camp Rockmont have invited Merri-Mac, once again, to their camp tonight for a dance! 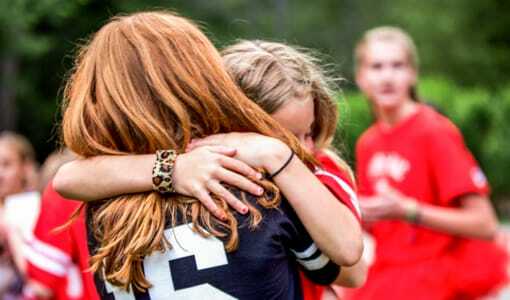 Girls in Intermediate and Senior camp cheered and immediately began planning their “camp casual” outfits. Shower schedules were read out and dress code guidelines were established. But all of the excitement for this evening did not prevent more fun and learning this afternoon! Nicole Y. and Kylie F.fenced it out in Fencing, Mary Catherine C. tried knitting with her fingers, and Cooking classes stuck their hands in flour to make personal pizzas! Madison S. loves Cooking because it’s “fun to do, and we get to eat good stuff!” I don’t need any more convincing, especially now that I’ve had tastes of all of the delicious concoctions whose recipes your daughters can access and recreate for you! 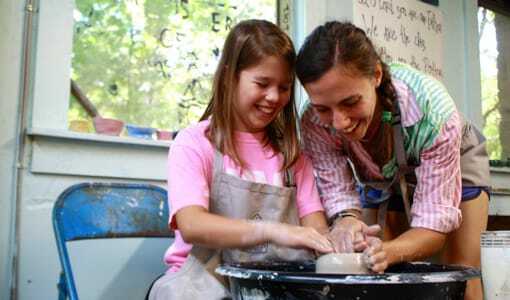 Girls in Pottery made slab-built cups, which are mugs made from rolling and embossing a slab of clay with different patterns, then molding it together with a handle. Isabelle E. got her bronze bar in Drama today, which requires the memorized reading of a one-minute monologue! Some girls had the exciting opportunity to travel off-camp today on various trips: the entire cabin of Tweedle Dee went to their counselor Grace’s house for some fun; Ivy C., Zofia C., Annabel C., Marin G., Abigail M., and Kylie Brooke T. went waterskiing this morning; Grace C., Sherrill B., Faith L., Alexandra V., MC C., Izzy O., Morgan V., Samantha C., and Madeline N. went on an afternoon hike! 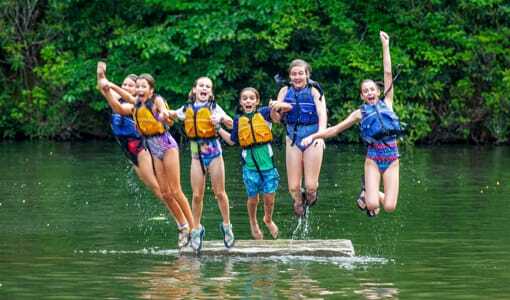 It’s been an exciting day at camp for more reasons than one, and soon I head off with your daughters to Camp Rockmont to capture their charm and exuberance through photographs. I have no doubt they will have a fun night, and I cannot wait to see all of their “camp casual” outfits and the smiles on their faces as they dance to the DJ and make new friends. Thank you for entrusting your daughters with us ~ we have been so fortunate to have the opportunity to teach them and love them well. A Tribe Fest Kinda DaySunny Day’s only bring out more smiles!